In 2009, Syracuse University sponsored a competition to design an energy efficient home as a prototype for the typical American city. 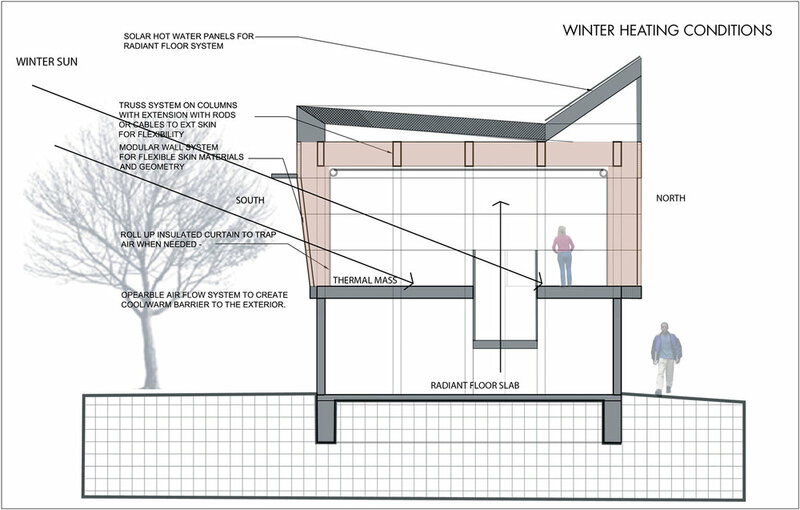 This entry proposes an efficiently sized two story home of 1,200 square feet and predominantly uses passive airflow systems for heating and cooling. This design reverses the typical two story residential organization by placing bedrooms on the entry level, where day-lighting is less critical, and an open living space and kitchen upstairs. A centrally placed stairwell creates an opening allowing heat to rise from a single radiant floor slab below. In the summer, the upper level can exhaust heat to keep both areas cool.